This contemporary house by Beech Architects has achieved planning permission as a replacement dwelling to an existing pre-fab lightweight dwelling. The existing dwelling is unsightly with poor thermal performance having little or no insulation. The proposal seeks to replace the dwelling in a highly sustainable way with an attractive contemporary design. The proposal seeks a one for one replacement of the existing unsustainable dwelling with a sustainable low energy house in accordance with National and Local Policies. It remains a two bed single storey dwelling. It is anticipated that the proposal will reach a level of sustainability achieved by less than 1% of houses built today. The main shell of the house is constructed of a FSC certified timber frame walls with 200mm of rigid insulation preventing any cold bridging and allowing a high amount of fully insulated internal thermal mass to balance out daily heat loads/ cycles. 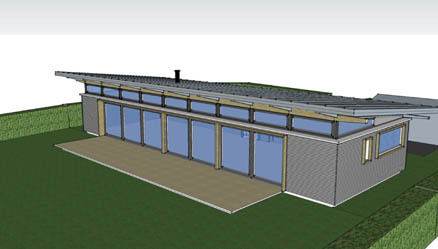 The ground floor will be solid concrete with a heated screed and tiled finish to allow the absorption of passive solar. The roof will have 200mm of insulation as will the ground floor. We aim to achieve AECB Step 2/ Passivhaus standards for U values, far in excess of current UK building regulations. A 6000 litre rainwater harvesting tank will be installed to supply water for outside taps, washing machine, and flushing WC’s. This tank will take all the roof rainwater from the house. Should the tank become full and rainwater need to be collected elsewhere the overflow will feed into a soakaway which will act as a stormwater overflow and thus prevent any water run off from the site even in the wettest of weather. This is an exciting opportunity to demonstrate how a replacement dwelling can be made with the minimum impact on the environment in every respect; fully sustainable, contemporary in design, fitting harmoniously within it's setting.